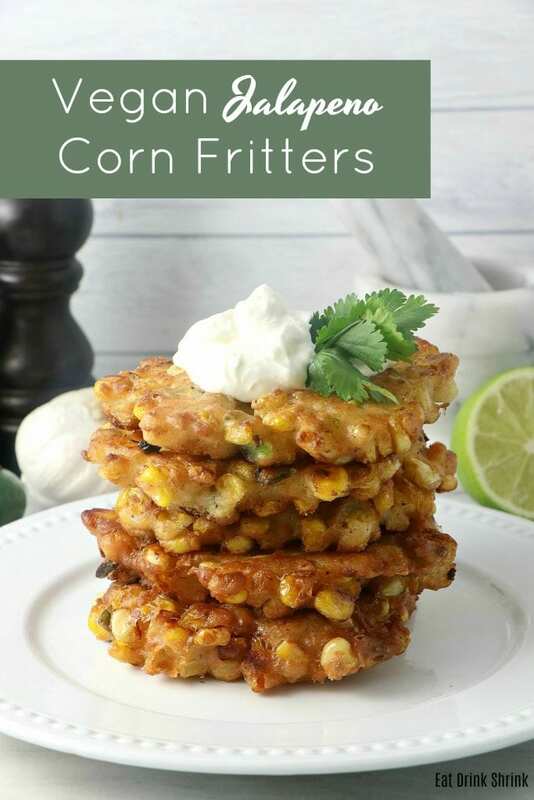 Vegan Jalapeno Corn Fritters - Eat. Drink. Shrink. I don’t know about you, but I rarely eat corn. Perhaps it’s because it’s the largest gmo crop next to soy, or the fact that it’s mostly carbs and sugar, but at any rate.. However, I love fritter concepts. Fritters are simply a bunch of ingredients that typically are held together with egg serving as the binder. You can fill them with whatever you like from veggies to quinoa and they are so quick and easy! That being said, I got the urge to finally explore a corn fritter..
and the vegan Jalapeño Corn Fritters were born! What I love about this recipe is, everything! It’s quick, easy, involves staple affordable ingredients, is great for entertaining, packs heat, a hint of sweet, and is non vegan approved! If you’re searching for more game day eats or simply love fun vegan concepts that pack heat,.. you have to try my recipe for Jalapeno Corn Fritters! Combine the almond milk with lime juice, set aside. In a large bowl, stir together all of the ingredients. Add the almond milk mixture and continue to mix until well combined. The batter should be thick to keep everything together when you cook them. Line a plate with paper towels. Coat the bottom of a large sauté pan with vegetable oil and place it over medium-high heat. Once the oil is hot, scoop 2- to 3-tablespoon mounds of the corn batter into the pan, spreading it lightly into a flat, circular shape. Cook the fritters for 2 to 3 minutes, then flip them once and cook them an additional 3 minutes until they’re golden brown and cooked through. Transfer the fritters to the paper towel-lined plate, season them immediately with salt and repeat the cooking process with the remaining batter, adding more oil to the pan as needed. For the dipping sauce combine all of the ingredients and set aside. Garnish the corn fritters with cilantro and serve with sour cream mixture!